You don’t go to a pub just to drink a pint. That’s a lesson I have been learning since I moved to England. Back in Italy, pub was synonym of “drink after dinner”. You can order a pizza or a burger or some fried nibbles (fried olives, chips, mozzarella…) but, if you are in Italy, you would definitely NEVER go to a pub to eat gourmet food. What a surprise when, just after I moved to England, my good friends Chris and Vicky invited me for a sunday roast in a local pub in Surrey. At the beginning I thought they were joking; then I realised they were serious and I thought I was going to eat a chewy piece of meat and some boiled potatoes. I was so wrong! When the most succulent slice of roast beef was served, accompanied by honey-glazed parsnip and carrot and a soft Yorkshire pudding topped with a jar of creamy gravy, that’s when I realised for the first time: pubs are not just places where to get drunk. The other night I had two tickets for a small production of Dracula, adapted and directed by Simon James Collier, at The Lion and Unicorn Theatre in Kentish Town area. I googled it and realised the theatre is just above a small pub with the same name: why not have a pre-theatre dinner at the pub? The Lion and Unicorn pub is just off the main road, on a residential road so you would hardly walk there unless you have a reason to. The mouth-watering scent of food we could smell at our arrival from the garden at the front of the pub seemed promising. What we didn’t know it was the food was even better than the smell of it! The pub was busy and lively, though not too noisy, and a welcoming waitress found a seat for us in a cute little table in the back of the pub. 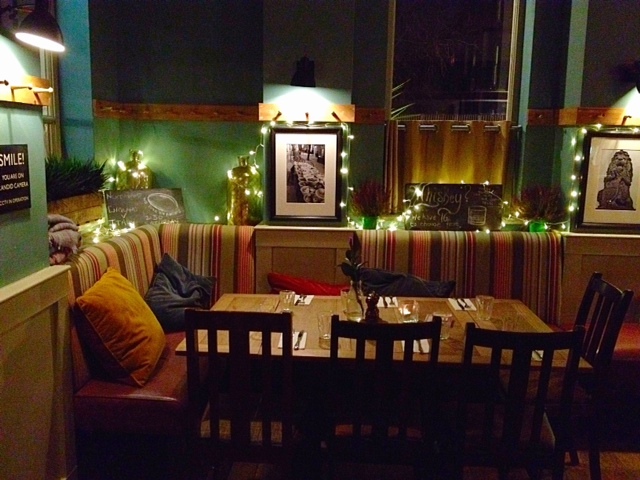 Original framed pictures, the feeble string-lights, the candles, the chairs that didn’t match with each other, the fireplace that was constantly topped… all these details contributed to create a cosy, unique atmosphere. The menu ranges from simple burgers and chips to more sophisticated dishes, including seared duck breast or salt and szechuan pepper squid. The waitress suggested to try the pheasant, one of the dishes of the day. “Always follow the waitress’ advice; she knows what’s in the kitchen”, is my motto. 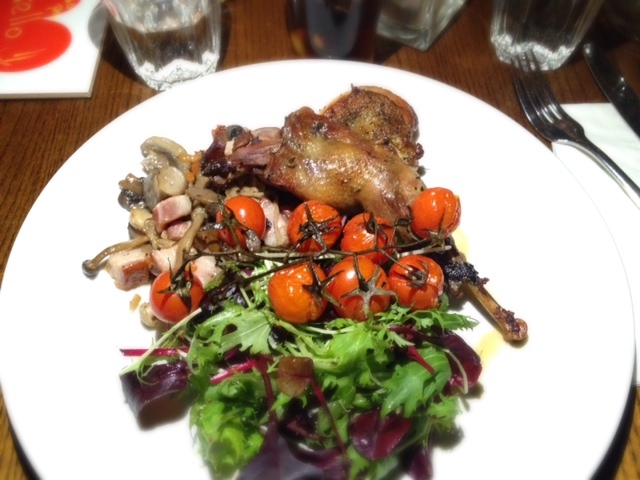 The pheasant was simply divine. The leg was crispy and juicy and the breast was seasoned with herbs and incredibly succulent. I loved the sides that came with it: the wild-mushroom and speck salad gave that extra kick of smoky and earthy flavour, while the baby lettuce and a whole bunch of roasted cherry tomatoes added some freshness to the dish. 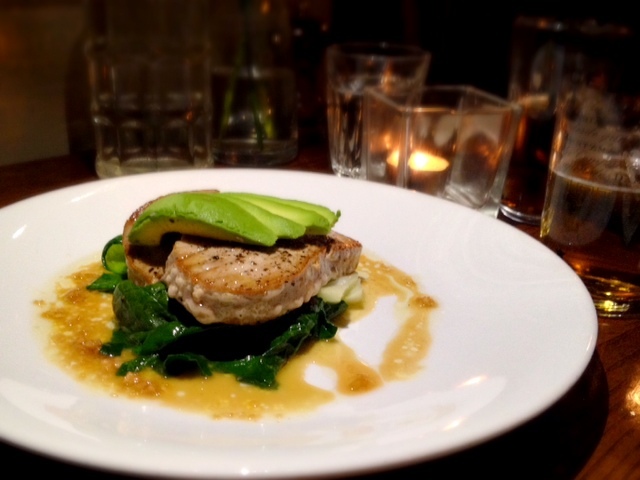 We also tried the tuna loin steak. Perfectly cooked (medium, as we asked, despite the waitress insisted it should be eaten rare) and moist, it matched by contrast the wilted spinach and bok choi texture. The avocado added creaminess and the zingy ginger and the garlic & soy dressing completed the flavours. What an unexpectedly truly delicious meal! 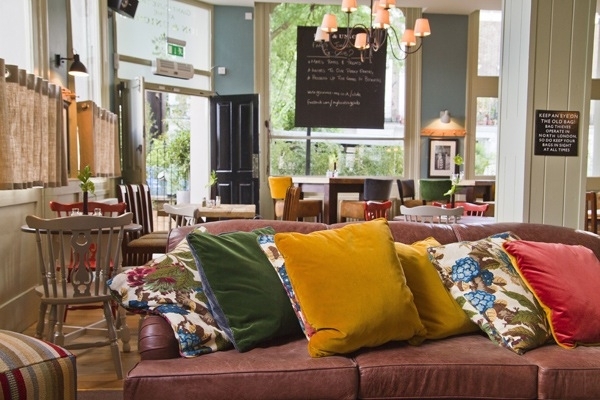 The Lion and Unicorn Pub is a pearl in the heart of Kentish Town that has been kept secret (at least to us!) for too long. “We will be back soon” was our comments while eating. It was also our comment when we saw the large back garden: a refreshing beer there in the summer should be just lovely. Eventually the theatre bell rang: it was the sign the show was going to start. So we had to get up and leave the table, as Dracula was waiting for us upstairs. This is good to know! I have often considered seeing a show at the Lion & Unicorn but haven’t gotten around to it yet. Glad I will be able to get a good pub meal when I eventually go! Hi mash29! The food was really delicious. I rarely blog on a place unless I really like it. I’ve recently realised there are few other pubs with theatre in London. One is in Kennington, where I live. I will give it a try soon! Please, let me know how you will like The Lion and Unicorn when you go. Great to hear – I’ll look up their theatre listings again! They usually do adaptations of books, which suits me perfectly. Did you enjoy the show as well as the food? Thanks for the detailed reply! I will choose carefully when looking at the Lion & Unicorn then. A friend of mine has also seen The Nether and recommended it – I have spotted it on TimeOut but, again, haven’t gotten around to buying tickets yet! Story of my life… I will have to get my act together. Hope you have a great weekend too. Mussels: select, clean, preserve and cook!